Sardine Flatbread - A recipe from Savor California, the online showcase for extraordinary gourmet foods and beverages from California. In a small bowl, mix together the olive oil and minced garlic. Brush over the flatbread. On top, arrange the sliced Kalamata olives, cherry tomatoes and fresh thyme leaves. Bake in the oven just until edges are a light golden brown. 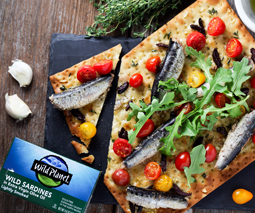 Remove from the oven and top with Wild Planet Wild Sardines in Extra Virgin Olive Oil, arugula and freshly ground black pepper. Enjoy as a meal or cut into pieces as an appetizer!